Click aquí para ser noticado de nuevos giveaways en tu navegador. ¡El mejor software de marca de agua con mayor velocidad y alta calidad! OMega Commander es un gestor de archivos moderno. WonderFox Photo Watermark es el software de marca de agua de nuevo diseño que evita que las personas roben sus fotos con marca de agua y retoca sus fotos con unos pocos clics. Es una aplicación simple y con todas las funciones para retocar fotos, que puede hacer fotos de marcas de agua por lotes, editar / eliminar información EXIF y también convertir el formato de la imagen. Puede crear marcas de agua de aspecto profesional con una variedad de herramientas: puede agregar texto, imágenes y logotipos a sus imágenes para proteger su contenido con derechos de autor. 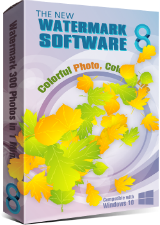 Software Watermark para Personal (1 PC). Sólo $ 19.95 (normalmente cuesta $ 29.90). Software Watermark para empresas (3 PC). Sólo $ 29.95 (normalmente cuesta $ 74.90). This is a real No. 1 speed DVD conversion and backup tool that provides the quickest solution to convert and back up DVD to a wide range of media formats. Brand New feature: 1:1 quick copy a DVD to ISO image and DVD Folder. Convert HD video to 300+ formats and devices - Simple yet Faster, when helping you deal with higher definition source. Provides a built-in compressor and online video downloader. Create, manage, copy and edit custom images. R E A L L Y ? But, you're not going to let us know UNTIL we install it? "Price: The program is available for $39.95, but it will be free for our visitors as a time-limited offer." ..................................................... R E A L L Y ? But, you're not going to let us know UNTIL we install it? I believe you are confusing two items. The "... time-limited offer" is standard on this site in the blue box under "Price". That refers to availability (download and registration) of the offer, NOT the length of the license. The terms of the license (length, includes updates, etc.) is something myself and others have repeatedly asked the GOTD team to make a mandatory field on this giveaway page. Without it stated, inevitably someone has to ask about it and then wait and hope someone from the publisher or the site will reply. That should not have to be and is completely avoidable. It is a simple thing to code yet, for some reason, the team here has been unresponsive to do it. Technically, they really do not even need to code anything as they could just ask the publishers of the giveaways to include it in their description. However, having it as a standard field right in the blue 'stats' box (where it belongs!) would make more sense. After all, the license information is a rather important factor in any software. Anyway, I hope that clears up your issue. Just to add, I am not bad-mouthing this site! I appreciate all the great software I have gotten over the years and just offering a suggestion to make it better for all involved. ray moore, I believe you are confusing two items. The "... time-limited offer" is standard on this site in the blue box under "Price". That refers to availability (download and registration) of the offer, NOT the length of the license. The terms of the license (length, includes updates, etc.) is something myself and others have repeatedly asked the GOTD team to make a mandatory field on this giveaway page. Without it stated, inevitably someone has to ask about it and then wait and hope someone from the publisher or the site will reply. That should not have to be and is completely avoidable. It is a simple thing to code yet, for some reason, the team here has been unresponsive to do it. Technically, they really do not even need to code anything as they could just ask the publishers of the giveaways to include it in their description. However, having it as a standard field right in the blue 'stats' box (where it belongs!) would make more sense. After all, the license information is a rather important factor in any software. Anyway, I hope that clears up your issue. Just to add, I am not bad-mouthing this site! I appreciate all the great software I have gotten over the years and just offering a suggestion to make it better for all involved. ray moore, over 10 years the term "... as a time-limited offer" means you have 24 hours to download and install it. Have you been passing so long? Practice your people-reading skills on the fly, provides insights on understanding the needs and habits of your prospect. Сhildren can personalize their favorite animals and create fun animated talking video presentations for school projects! A puzzle and builder adventure game. Select and play KinToons nursery rhymes. Get web notifications for WhatsApp accounts. Introducing the new generation of math learning apps powered by handwritten digit recognition. THINGO is a hot new game, stemming from the basic idea of Bingo. Tackle tricky puzzles and enjoy an exciting story, lovable characters and stunning scenes and locations! Help Sam Peters to solve all kinds of challenging quests and elaborate riddles.